December 03, 2018 / Kristy M. Ayala, M.A. Welcome to December and the home stretch as we embrace the holiday season, and the end of the year. I want to thank you for the thoughts, prayers, notes, and check in’s over the last few weeks as my community was impacted by the camp fire. It’s been a really intense time but my little community has rallied around our neighbors as we all deal with the aftermath of the fire and the flooding. Your kindness and support has meant so much to me. One of the things that has been prescient for me at this time is that no matter where we are, we bring the holidays with us. Home is within us, it’s not necessarily one particular place, but rather home is in our hearts. We can create and celebrate the holiday season no matter where we are as long as we focus on the love that’s already within us. I know that this time of year can bring up a lot of emotions, feelings, and memories. You may be separated from your loved ones, or you may be someplace that doesn’t necessarily feel like home. However, you can create a feeling of home by investing in the activities or experiences that feel like home for you. Maybe it means spending time with your Framily, the friends that you consider family. Maybe it means making a special meal or dessert which really anchors the holiday spirit for you. Maybe it means volunteering or supporting someone who could use help this holiday season. Maybe it means listening to a special record that makes you think about a loved one who is no longer here. Maybe it’s wearing festive jammies and watching movies while eating popcorn. The truth is that there’s no one way or right way to celebrate the holiday season. 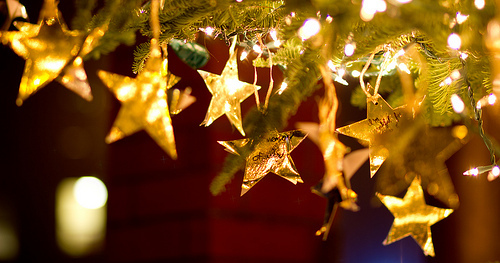 There are lots of ways to honor the traditions, joys, and special moments this month. By taking time to do a few things that fill you with love, you’ll bring the holiday’s home no matter where you are or who you’re with. Please remember that while this month is often filled with hustle and bustle, and places to go and people to see; that it’s equally important to take some time to slow down. I know it seems counter intuitive to slow down during a busy season. However, it’s in the slowing down and paring down your list of to do’s that you’ll more easily enjoy the parts of the season that speak to you. The slowing down allows you to more fully experience the season. It’s okay to pass on the activities that don’t feel like a fit this year and to embrace the ones that are genuinely right for you. You don’t have to explain why something isn’t a fit, you’ll know it in your heart and that’s more than enough of a reason. So, this season, no matter where you are or who you’re with, I’m wishing you a gentle, supportive, and joyful season. Let being home for the holidays mean being filled with the joy and love that’s with you right now, inside your heart. I’m sending you so much love and I’m wishing you a very peaceful and blessed holiday season.